Teltek Grader is one of the most flexible grader solutions on the market. 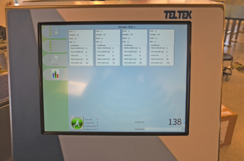 Teltek have developed a unique software that allows the user to easily choose desired operation. Classic grading, batching to portion weight, to a specific quantity or combinations of these operations. 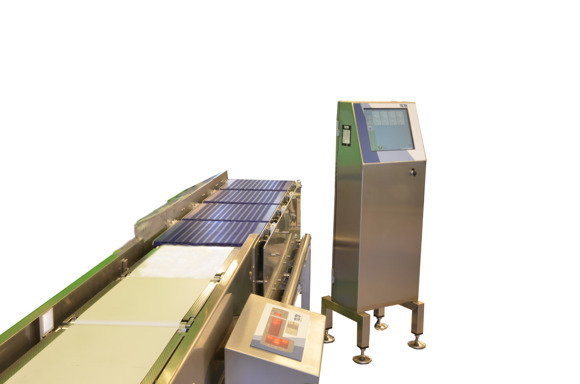 As standard the Teltek grader gets the weight input from a Teltek C-series checkweigher, but since it runs an open protocol it is possible to use other checkweighers, static weighers or even vision systems to provide the input data to the grader. Teltek grader is available with a number of different sorting methods. Which one to use depends on product type and speed. Pneumatic diverter arms or pushers is the most common solution. 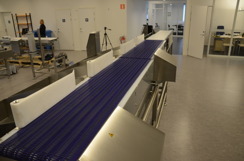 For fresh and sticky products our Lift-flap solution often proves to be the most suitable way to sort the products. 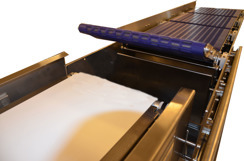 By lifting short individual sections of the grading conveyor the products will drop down to a stainless steel container or sideways facing conveyors that transports the products automatically to the next station. 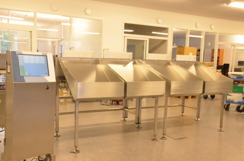 The equipment has a very hygienic design and is easy to clean. The modular belt is open top version as standard.